The way to a man’s heart, is through bacon. That, I am sure of. 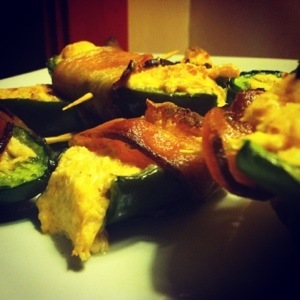 Particularly bacon wrapped cheddar jalapeños. Nothing more attractive than that, right? Set oven to low broil. Cook back strips for five to seven minutes, until bacon is heated and has lost some fat. Cut bacon strips in half and set aside. In a bowl mix cream cheese, cheddar, and spices. Spoon mixture into the halved jalapenos. Wrap each jalapeno with a strip of bacon. Spear with a toothpick so that the bacon stays on. Place on a cookie sheet and bake on the lowest rack for 20 minutes or until bacon is crispy and jalapenos have been roasted.